Chinese Cloisonne Bowl and a French Cloisonne Inkstand. 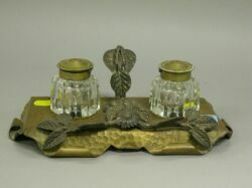 Silver Plated Floral Mounted Hammered Copper and Cut Glass Inkstand. 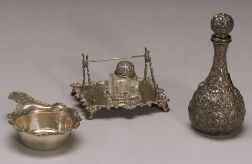 Lot of Approximately Twenty Asian Boxes and Stands, an Inkstand, Bronze Incense Burner, Pewter Tea Cannister and Jar. 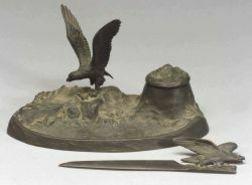 Lot of Desk and Dresser Items, including ebonized wood inkstands and manicure set holders, glass paperweights, etc.